Today, I was having a little chit-chat with my father and unconditionally he showed me one photo. The photo was like from some dreamland. I couldn't believe it. He told me that, that was how Moon looks from north pole. Upon asking more, he told me that his friend gave him the photo and he collected it as souvenir. I just couldn't believe. Because, I felt, if moon came that near to earth, then only God knows what would happen next. I've never ever seen the moon of that size and I've never been taught that moon would look that big from some part of the earth. I searched on Internet and I found the exact photo(which is below). We all know that in North Pole, there sun never sets for whole 6 months. 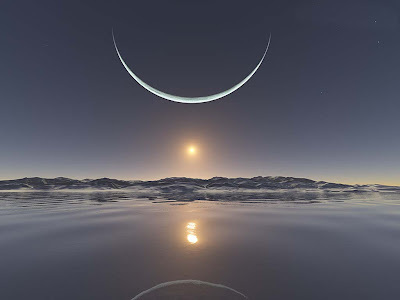 And, I found people writing that the following picture has been taken during the month of June in North Pole, where sun is getting ready to go down. And, that Magnificent view of Moon was captured. That was their views. Quite convincing!! But, somehow I managed to find that It wasn't real. Because, I spent few more minutes searching on Google out of disbelief and I got the real answer hidden deep within. Snopes.com has revealed the real truth behind this mysterious photo and the creator of this magnificent digital image is Inga Neilson, a german student. If you go and check his site, you'll find his other creations similar like this. He was using Terragen(Terragen™ is capable of photorealistic results for professional landscape visualisation, special effects, art and recreation. ),a computer software which can generate real lifelike digital terrain images. 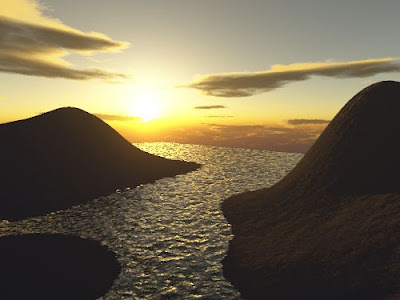 I've used Terragen before and it's wonderful free software. You can grab the idea how to work with it within few minutes and start creating your own wonderful dreamlands. 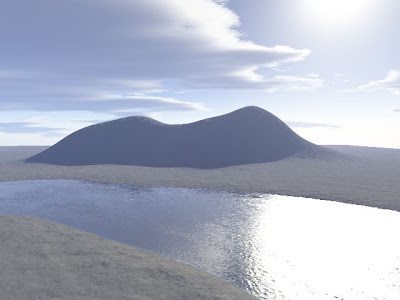 Followings are my Terragen images which I did few months ago. Not impressive but I tried. They say the moon looks that big cause you have the horizon to compare it to. I can't find it in the internet..hmmn..you shouldve said what that phenomenon is called. Anyway, the picture is just breathtaking and i really do hope that one day (if ever that really happens) i'm gonna be able to see it..
and i wanna see the aurora borealis too...it's also an amazing phenomena. Can't belive a program can do that! I'm so gonna hide forever...another humiliation for web..
'Read more link' sometimes. Something different is inside always :) Keep rolling in bro. There would be apocalypse if Mooon would come that close.. imagine the Tidal waves growing , gravity of earth pulling moon towards earth.. oopps it's horrific to imagine.. Very cool pic even if it's a phoney. The technology out there to make these types of images believable is pretty amazing (and scary). Thanks for sharing AND doing the research to find out the truth about it. You are most welcome artisticvision. How uneducated are you people? There is no land at the north pole, there is no open water (all ice pack), and in the summer the sun is never high in the sky, it loops all the way around, staying near the horizon, and therefore so does the moon. Jonathan, did you read the whole article? and, quickly coming into conclusion like that shows how 'educated' you are.